Tripamundo is a cloud content management system for travel organisations. It's designed for the most important moment in travel planning: decision time. Tourism promoter. Travel portal. Airline operator. Hotel chain. You need to reach your customers at the critical moment, when they're deciding where (and when) to go. The Tripamundo CMS is optimised for pre-trip content. It's the perfect way to deliver inspiration to your customers... and bring them to a decision. Use Tripamundo to manage data for any website or app (we'll even build the app for you). Encourage spatial visitor spread by determining which ideas appear. 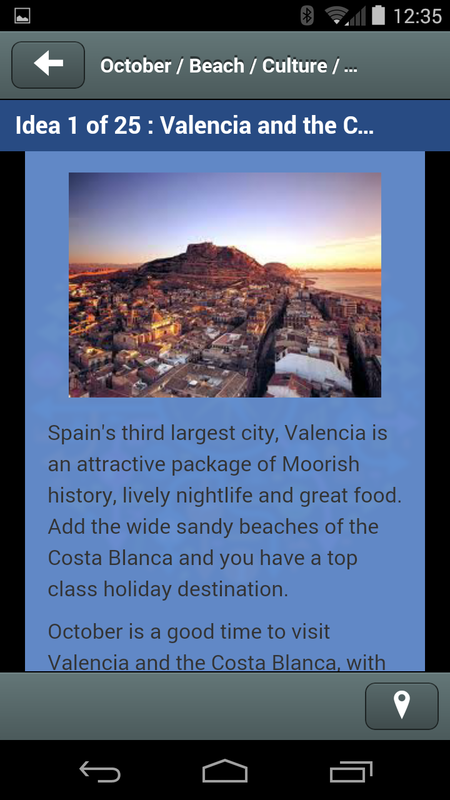 Build perfect destination suggestions by aggregating categorised data. Inspire prospective visitors with highly customised ideas, focused on their interests. Promote special interest tourism including golf, adventure and well-being. 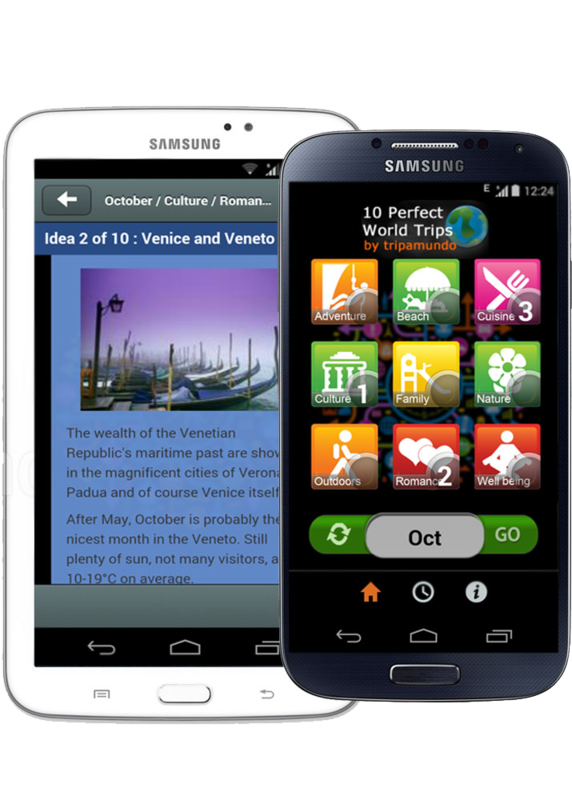 Offer a range of apps for mobile, tablet and web. 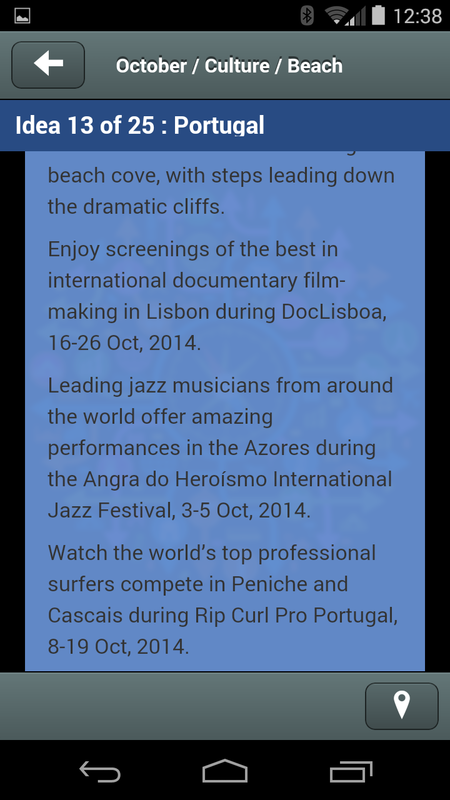 Show relevant events, develop all season tourism. Get inspired for your next world trip. 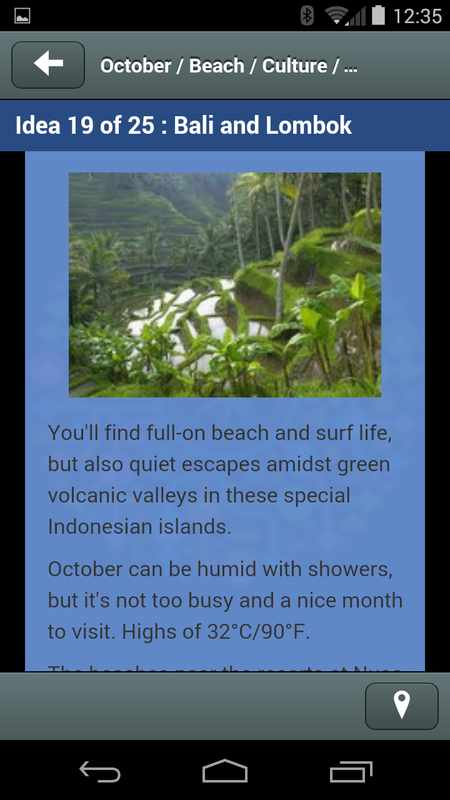 Select your travel priorities, pick a month, and find ideal trip ideas. Discover your perfect destination. Select your travel priorities, pick a month, and see your perfect 10 destinations. 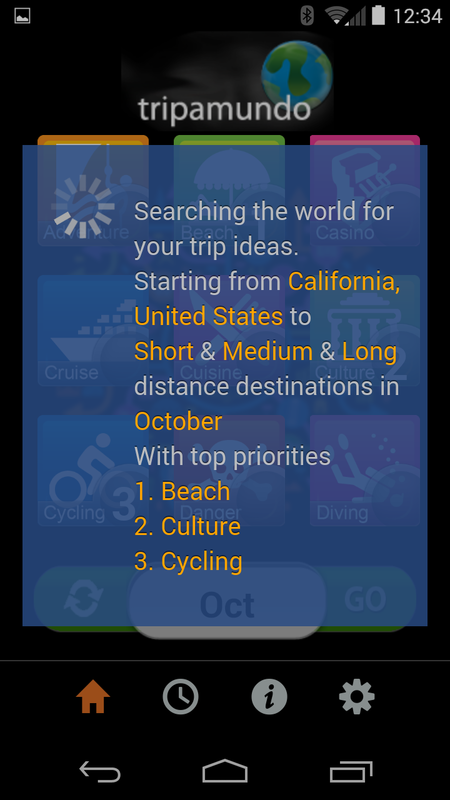 This simple app has a limited number of travel interest categories, and returns a maximum of ten ideas. It includes a distance filter. Pick your top 3 trip interests. These compact islands deliver on their Caribbean promise, with plenty of sun and sand, reef and nightlife. Conditions: The islands are very busy around new year, although it can be rainy now at the tail of the wet season. Later in the month it is drier, with perfect temperatures of 82°F on average. Event 1 is going to be held soon on the amazing 12-14 June 2014. Event 2 is going to be held soon on the amazing 12-14 June 2014. The content management system has a rich feature set that enables deployment of a diversity of pre-trip apps. Nothing to install. Your app data is stored in the cloud and managed by browser. Use Google identity services for secure multi-level access. Look after your own data, or let our team of travel editors do it. Control what data is served to which apps by destination, destination level and geographic zone. This supports customised apps and market segmentation. 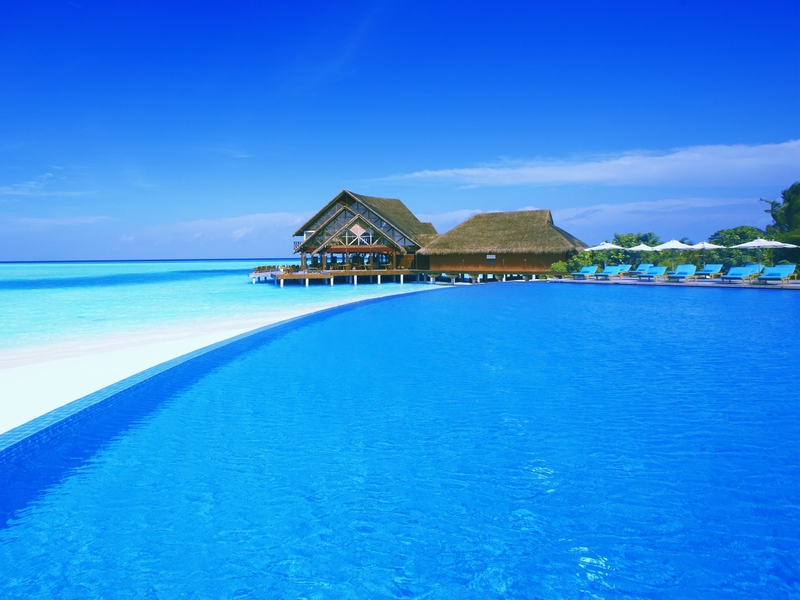 Data categories include Beach, Casino, Cruise, Cuisine, Culture, Cycling, Diving, Family, Fishing, Golf, Music, Nature, Outdoors, Party, Romance, Shopping, Snow and Well-being. Events are categorised so that only relevant ones are shown. Full date control, so stale events do not appear. Event image and URL support. Fine control of image serving. 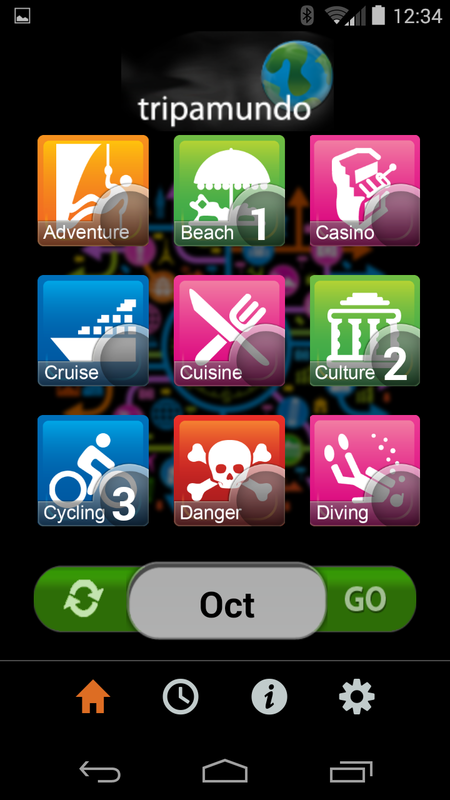 A different image can be shown by destination, month, interest category and event. The documented JSON application programming interface ensures client app independence, and supports a diversity of apps accessing the same dataset. Choose the right package for your organisation. Contact us for content creation and app development pricing. ©2014 Textamundo Ltd., All Rights Reserved. Tripamundo is a service of Textamundo Ltd., a company registered in Ireland. All information and materials contained on this website and in the Tripamundo CMS are protected by copyright law. No part of this site or any Tripamundo CMS content may be reproduced without our prior written permission.